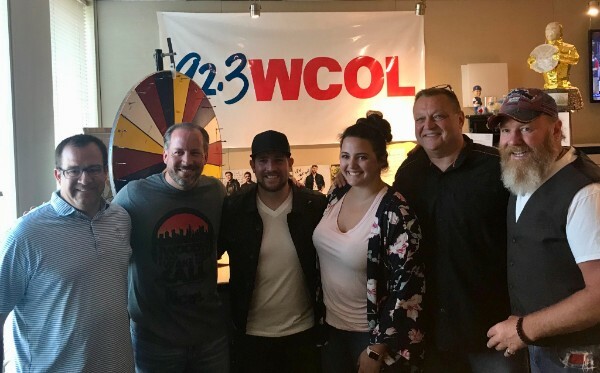 LEE GANTT’S “RUINED THIS TOWN” CONTINUES TO GAIN POPULARITY IN COUNTRY RADIO; PICKS UP ADD BY COLUMBUS, OHIO’S 92.3 WCOL | 2911 Enterprises, Inc.
Nashville, Tenn. – Lee Gantt is excited to announce that his hometown Country music radio station, 92.3 WCOL in Columbus, Ohio, has added his debut single “Ruined This Town” to their regular playlist. The announcement was made as a surprise to Gantt – who was already participating in a previously scheduled on-air interview with the Morning Crew hosts Kayla Hanley, Woody Johnson, and Program Director, Dan Zuko – talking about his upcoming performance with Dustin Lynch for WCOL’s Red, White & Country concert on July 4th at Flannagan’s Dublin. Gantt has been seeing “Ruined This Town” steadily gain momentum since debuting on Music Row’s Country Breakout Chart in March. Since that time, the song continues to gain popularity across many different Country radio stations, picking up adds (click here to read more) across the U.S.
Gantt also recently made his CMA Fest debut (click here to read more) earlier in the month, and plays regularly around town in Nashville, along with other regional tour stops. Lee Gantt hails from Columbus, Ohio, and honed his craft while attending college at The Ohio State University, performing at local clubs around the area. His music reflects the story-telling tradition of artists such as Hank Williams Jr and George Jones, while pushing the musical envelope in a likewise manner to today’s biggest artists such as Eric Church and Jason Aldean. He has opened shows for such chart-topping favorites as Dustin Lynch, Chris Young, and Colt Ford. Gantt has already started to develop a loyal legion of fans who follow him throughout his social networks, and have helped to make his 2017 debut EP Casa Blvd, a critically-acclaimed favorite.